(Optional) If you don’t feel comfortable using the marinade that the meat was in, heat it in a small pot for 2-3 minutes on low heat. 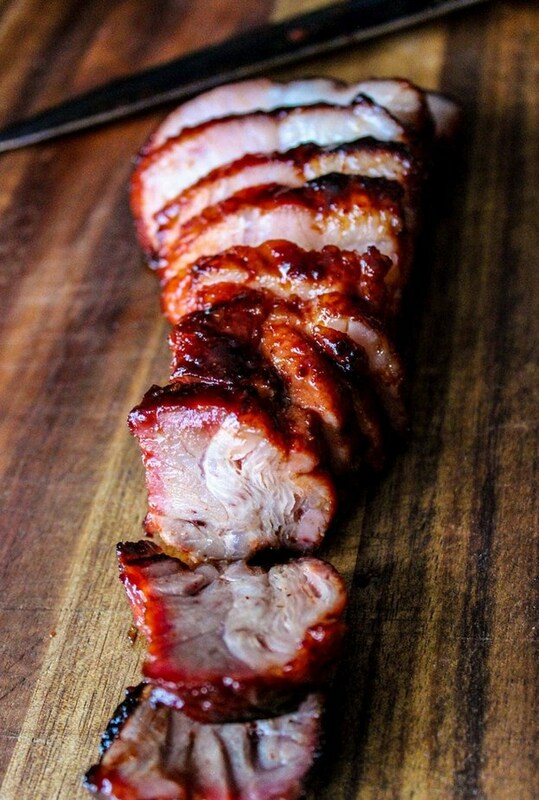 Cook the char siu for 15 mins on one side, then flip it for another 10 mins. Check the meat thermometer. Temperature should be around 145F (62C). If it’s not, keep the meat on longer until it reaches that internal temperature. Set up the meat on the tray or roasting rack and use a rack so there is air flow below the meat. I like it line it with foil before setting down a rack for a easier clean up. If you don’t have a rack, you can take foil and crunch them up into foil balls and rest the meat on that. Set the oven to 400F (204C) and cook it for 20 minutes a side for a total of 40 minutes. Cutting the pork up in long thin chunks allows it to cooks faster, and you get more surface area for sauce.